Loving my final walk in the woods(Forest Park) before I set off for the desert. Those of you who are new to following me as I hike, I do post a daily account with mileage and photos each night from my tent. Ideally, I would have internet service to post each night, but realistically, that won’t always be the case. Don’t fret if I go a few days without an update, once I do get service, I will post all the days that have yet to be posted. I know many of you read the blog with your morning coffee and it is my intention to make that happen as much as I can. As a warning, I’ve already been told that reception in the first section is pretty low. In addition to the daily posts, I will bounce my laptop to myself every three weeks or so to upload videos and slideshows that summarize the previous section. Finally, I have been having a great time posting some random bonus things on Facebook from time to time. Be sure to “like” the Walking With Wired Facebook Page for those status updates. As time has gone on, I’ve gotten more and more personal emails and less comments on the actual blog. The fun of the blog for me is sharing my trip with people all over the world. Personally, it has been great to go back on my blog over a year later and see those comments and words of encouragement that were written as I hiked the PCT. I know many of you are intimidated by publicly commenting, but I recommend it. I have a quick tutorial on how to comment on this blog and complete a one time registration that will allow you to get my responses emailed directly to your email account. I understand if you still comment by email, but my family and friends especially enjoy being able to view the comment too. If you haven’t signed up to comment on the blog, check out the “Sending Comments” tab at the top of the blog. I may not be able to reply to everyone personally while I’m hiking, but know that your comments are encouraging and motivating! My new tent, sleeping bag, and backpack. In the last week, my new gear has arrived and I am excited to say that my final BPW is officially 12lbs 13oz! I still can’t believe my pack is that light! I never imagined being anywhere near 12-13lbs considering I hiked the PCT with a BPW of just over 16lbs. I’m really proud of this and excited to see how it enhances my hiking experience. I tested out all my new gear and my initial thoughts are much more positive than I thought they’d be. I’m a creature of habit and worried that this change would be difficult for me. 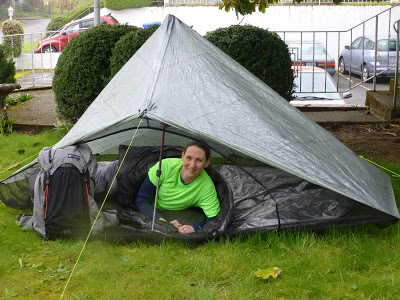 I pitched my new ZPacks Hexamid Solo Plus tent quickly and easily on the first try. I was really happy with the space inside, which was my greatest concern and with the extended beak I am hopeful that I’ll have solid protection in heavy rains and storms. I’m slightly put off by the translucence of the tent as I enjoy my privacy, but I’m sure I’ll adjust. 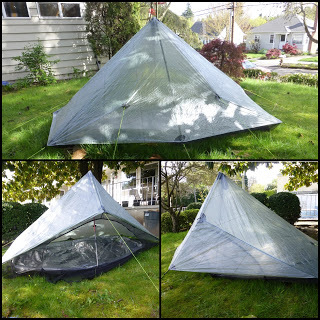 A tip to those getting a new tent, be sure to add some sealant(silicone mixed with some mineral spirits) to the groundsheet on both sides in a grid pattern to reduce slipping and sliding on an incline. 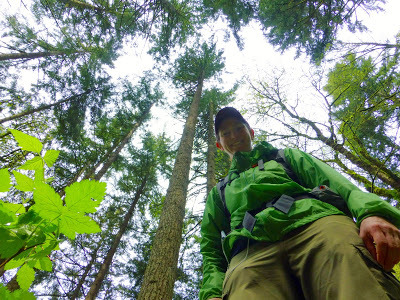 I tested out my new Gossamer Gear Mariposa Ultralight Backpack on my final training hike. I packed it with all my gear and then 5L of water and it felt great! Really excited about that! 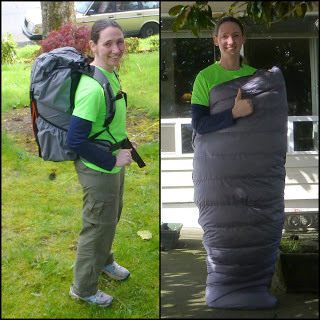 My ZPacks 10 Degree Sleeping Bag is toasty warm and I’m hoping it will keep me warm on those cold desert nights. I have chosen to forgo the sleeping liner I have used previously to save weight, but have it ready to be sent if I feel like I’m not warm enough. 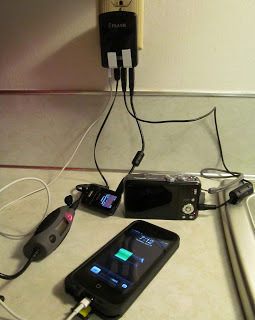 Wired, gettin’ all charged up! I’ve updated my Care Packages Tab on the blog. It has detailed information of what I’d love to receive on trail along with an itinerary of my resupply locations and estimated dates. I already want to thank two people who have already provided gifts for my first few legs! Where’s Chris is a future PCT hopeful who has successfully become quite the trail angel for PCTers in Oregon and Washington. She has provided me with 1 Mountain House dinner for each of my four first legs and four more that will be spread out along the snowy Colorado section. Keep an eye out for her as she may pop up anywhere! Also, a special thanks to GoalTech who is also a future PCT hopeful. He has provided me with the first audiobook I plan to listen to fully on the trail this year, Jon Krakaur’s “Into Thin Air.” THANK YOU Where’s Chris(and Charles) and GoalTech! Fellow hikers just ahead of me in New Mexico. I am super pumped about the map I have embedded on my Where’s Wired Tab. 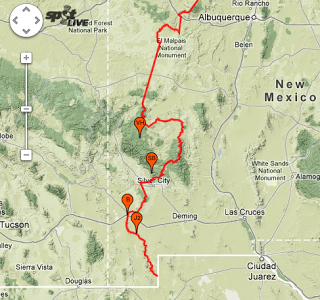 The map shows the locations of myself and other CDT hikers along the CDT when we push our SPOT check-in buttons. I give more detail on the tab, but, here’s a photo of what it looks like zoomed in on New Mexico. My little green “W” will be on there in 3 more days!